Halloween this year was pretty fun and i'm glad it landed on a Friday!! It was actually a chilly weekend here in Dallas.. but still not too bad! to this place called Salata.. it's a new little place where you can create your own salad or put it into a wrap! We were planning on Chipotle but when we walked in it was PACKED! So salads it was!! Once we finished lunch we headed back home to get ready for the rest of the day! Lexi had a birthday party that afternoon so we had to hurry and get her hair, make up, and nails done. It was Halloween themed so they got to wear their costumes which made it all that more fun! It literally takes me an hour to try and attempt Elsa's hair..
Lexi's hair is really thin and add in the fact that I cannot figure out how to french braid..
and that turns into an hour of me trying to figure out just hair. Oh and I had to do it all the Friday before for Trunk or Treat at our church..
pretty sure I made it look better the first time around I tried ha! then went back to pick her up and a couple hours later Ty got home from work and we headed to our neighborhood party where everyone chipped in for pizza and brought desserts! Lexi loved running around with all the kids and it made it so much more fun! We knew three other families from our church and we knew another family that Lexi goes to pre-school with. I actually really love how active our neighborhood is.. we are just renting this place until January but it has been fun to live where we are. The neighborhood has a facebook page which I'm pretty sure is a common thing out here for neighborhoods to do. It's a really family friendly community and I love that! After pizza and chatting with everyone we set out with a group from our church to start trick or treating! They literally ran from house to house for a good thirty minutes and were loving life! By the time we got back to around our street Lexi was getting wiped out and asking Ty to hold her.. but we still had to make our rounds back over by where we started because we drove over to where the pizza party was. We did A LOT of walking.. for sure the most I have done in the last 8 months!! Seriously the worst time for the night after Halloween. But we all woke up and got ready and headed to the fields..
oh and did I mention it was 38 degrees.. super chilly for around here! 1 player showed up for the other team so they canceled it! Talk about annoying! Later that night we were invited to a Clue Party.. it was in one of the parks next to our friends neighborhood so we did a ton more walking! I was just glad I was technically still 3 1/2 weeks out from being due or I'm pretty sure those two days combined would have put me into labor! It was our first time experiencing a Clue Party.. they did such a good job putting it all on. Before the game started we all met at the pavilion and had a soup potluck for dinner. Its basically a live clue game acted out..
You split into teams and you follow a map to different locations with different suspects acting out their alibi and finding murder weapons throughout the park and the neighborhood with flashlights. Then everyone meets back up once they figure out who they think the murderer was. With donuts, apple cider, and hot chocolate for late night snacks it was a pretty fun Fall night! Lexi stayed at a friends house so it was a nice date night for us before the baby comes! I should have been better about taking pictures but I was a slacker! Cute! 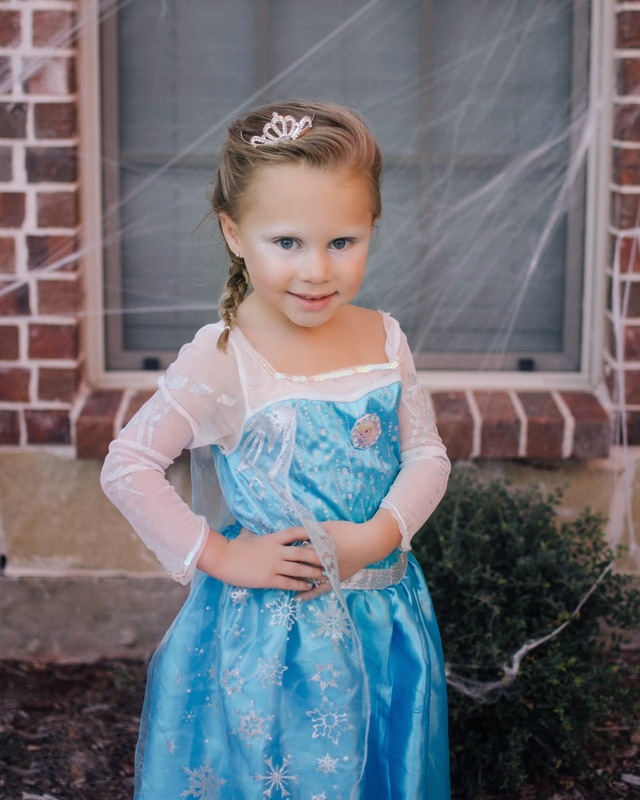 I love her little Elsa costume! !